Time’s latest cover is moving for all the wrong reasons. 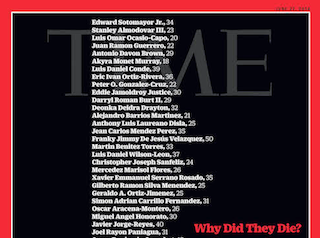 Against a black background, the names and ages of all 49 victims of the Orlando shooting are listed. The next steps seemed easy to predict: national mourning, bipartisan shows of unity and a redoubling of resolve. But somehow the script went sideways, and the country veered off track. It was not just that these murders struck at the tender inflammation of three long-divisive topics: guns, God and Gays. The killer attacked in a season of turmoil as voters considered an election that was fast becoming a national referendum on the country’s very identity, its commitment to pluralism and its role as a beacon in the world. The terror this time did not unite. It tore. The new issue of Time hits newsstands tomorrow.